This little daisy is well suited for a myriad of uses. Cascade it down a gentle slope or use it in mixed borders like the one on the left. It also looks great in a container with other flowers or all by itself or as a naturalized look ground cover. 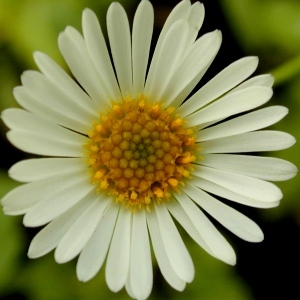 Also called Mexican Daisy, these flowers are a great treat for the bees and the tiny beneficial flies and wasps. Italian Oregano Thyme (the small purple flower on the left) blooms beautifully with these Santa Barbara Daises in a location that receives morning shade and afternoon sun. One plant spreads out to about two feet and lazily reaches maybe 8 inches in height. It is one of the first flowers in spring and one of the last flowers to stop in winter. It prefers a coastal climate and the interior heat of summer does make it shut down. But, as soon as the weather is a cool again in fall, it perks right up and blooms until hard frost. It also reseeds well. We recommend cutting it back to the ground at the end of summer bloom or at least at the end of fall bloom. 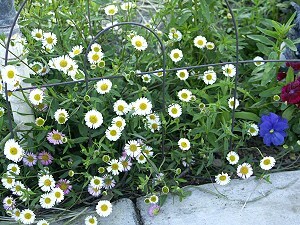 Santa Barbara Daisy or Fleabane is one of the best flowers for attracting beneficial insects. Beneficial Insects not only help to get rid of bad bugs, but they are also important pollinators. 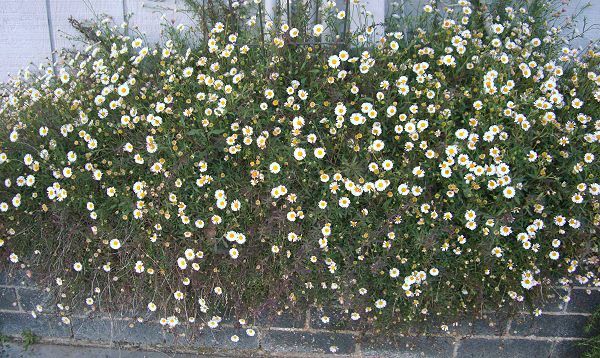 Though not English in origin, The Santa Barbara Daisy has a Cottage Garden look is included in our English Cottage Herb Garden Six Pack. This plant is often available in plug trays. These trays hold 128 of all the same plant. They are a great low cost way to fill a lot of space. Each cell is 3/4 of inch by an inch. 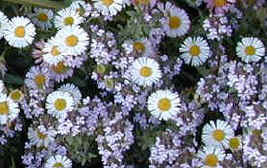 Check here to see if Santa Barbara Daisy Plug Trays are available.